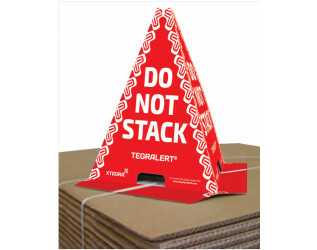 Do Not Stack Cones are simple to use, effective, and highly visible deterrent to pallet stacking where this may cause damage to the consignment, or to the integrity of its packaging. These cones are supplied flat-packed and are quick to assemble. They can then be attached to a palletised consignment either by taping down the feet of the cone, or by running a pallet strap through the pre-cut slots.